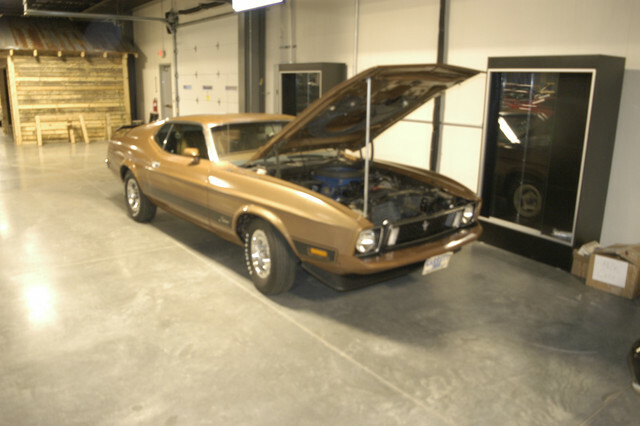 Well guys and gals there is a Ginger 5-H metallic 1973 Mustang Mach 1 sitting in the MOM, Mustang Owner's Museum for the grand opening next week. It was driven in under it's own power. Today was a very long day up at 6:30 and to garage to resume getting the carpet in and seats. My nephew was due here 8:30 with trailer to haul. Of course it is raining and we had over 25" in February so nothing bu mud outside the garage where all the soil washed in. So he arrived and helped me get the last pieces into the interior. I hook up battery and crank it over and it fires but backfires out the carb. I hook up timing light and yes we have a spark. I check sequence of wires on distributor and is ok. I did not pull dist. so I know in time. Like Albert Eienstien says Doing the same thing expecting a different outcome is a sign of insanity. So I pull the dist. cap and crank the engine. For some reason my feeble brain remembered the dist. to go clockwise, NOT. I have the wires backwards. Switched them and cranked and it fired right up after 37 years of sitting. Carb needs adjusting for choke and idle but it runs, HURRAY. So now to get a clean car out of garage through about 80' of slimy mud. What a struggle took hours. Got it to gravel and washed the mud off the tires. Had to drive down the road to neighbors pasture with enough room to load the Mustang. Pasture fits. 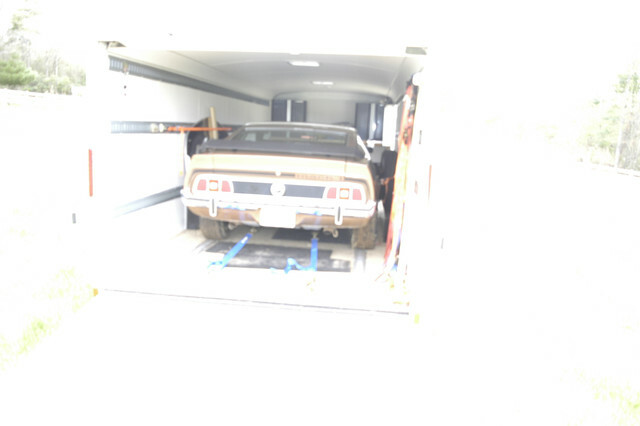 We got to the museum just before dark jacked it up and put the new Goodyear RWL tires on and drove into the musuem. Cannot give lots of info on cars in the display but I think it represents our years much better than some do. 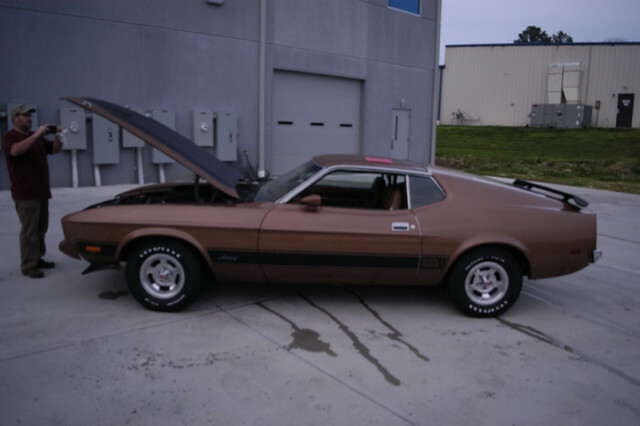 There is a 71 429 Mach 1 also grabber blue but shiny black out on hood. The earliest car there is serial # 0000004 a black convertible that was used at the NY worlds fair in the Ford ride and sent back to factory and given a drive train and sold. It has one of the very early Prototype tooling hoods on it. There is a barn find car that is serial #211 a first day build car that is all tattered for sure. There are some radical cars one with super charger on a 5.4 with twin turbos I think over 1,100 rear wheel horsepower. I think there are 15 more cars to show up yet and then they will set up the display. So I think this shows what a car can endure and still be a solid car. 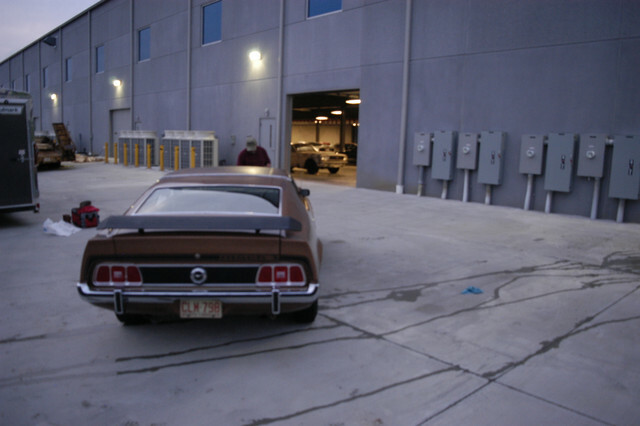 The car has sat since 1982, 12,301 miles when check in at the museum and started up with no stuck valves or engine issues. It was in an open pole barn with just a Beverly Hills car cover for protection. The car has still not been washed with running water only wet micro fiber. It has not been buffed and I use only one wax on any car. The paint on this car show how well it protects. Here are a few sneak previews to the museum. I am beat having a few whiskey and sprites with some Ibuprofen and then long sleep for me. I even took pups to sitter so I can have long sleep. A crazy old man can accomplish a few things if he sets his mind to it. So never let anyone tell you that you cannot do anything you set your mind to. I guess my Nikon is dead will not focus anymore. Awesome, congrats on making your goal! Maybe now you can focus on fixing that back of yours and getting well. My wife had two spine surgeries last year and the difference is incredible. Congratulations Dave. You have done a magnificent job. The car looks great. Incredible to see a 45+ year old car looking and running so good. I cant wait until i have the chance to visit the museum. Thank you for your contribution. Visitors will not know the efforts and passion behind to get the car there, but we do! The car looks great and will surely let the youth dream! What they all said David, I've thoroughly enjoyed reading your updates and at some points I was struggling to keep up! You've definitely inspired me to keep going with my buiild although not at your frenetic pace ! well done! I'd love to go to that museum one day and check it out. The car looks great. I am looking forward to seeing it one day at the museum. Job well done. Great work David you should be very proud and I know you have made all of us honored and proud to be part of your journey to get the 73 back. Thank you for all of the updates. Get the rest you deserve and enjoy knowing that you have delivered an awesome survivor to the museum for people from around the world to enjoy.